4 How did we do it? We did a 12 month campaign with Why Bother Cleaning, starting in November 2016 and ending November 2017. Within a few months we had improved their keyword rankings significantly. Often with local businesses, just moving up a couple of positions for a keyword can have a huge impact. SEO for cleaning companies can work well and provide a decent ROI if results are achieved. Cleaning clients are often retained for many years and have a high value associated with them. Our client wanted to target both the domestic and commercial market, as well as the end of tenancy cleaning market. 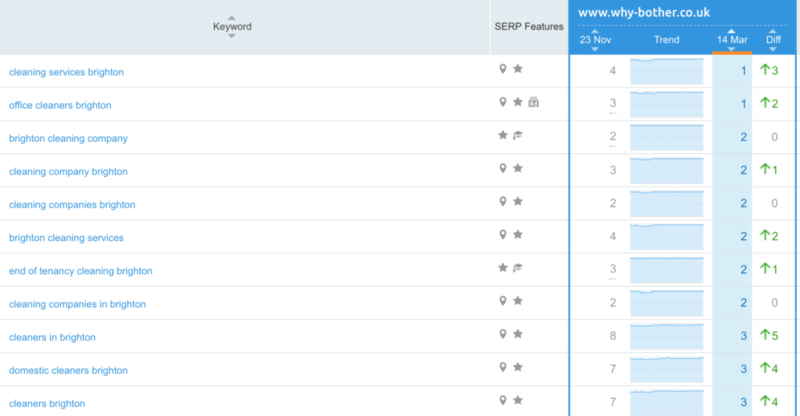 Below is a rundown of some of the keyword changes we saw in the time of the SEO campaign. The commercial market is highly competitive, though we managed to achieve position 1 for ‘office cleaners brighton’. These results through SEO resulted in a steady flow of cleaning service enquiries, allowing our client to reduce Google Adwords spend and the cost of flyer printing and distribution. 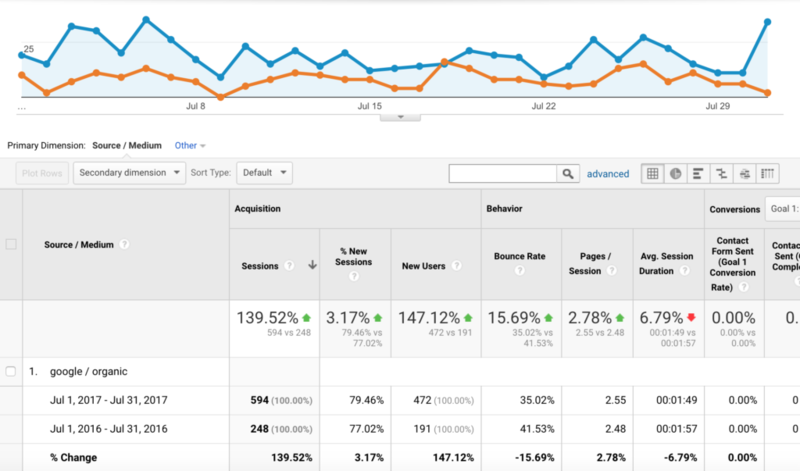 Comparing June 2017 to June 2016, we achieved a 140% increase in Google traffic for our client. The campaign kicked off with us supporting the website relaunch. Their old website had been live for many years and although it was dated, it had some good keyword rankings already. Protecting this initially, before progressing, was our first milestone. We successfully supported the relaunch by providing all details to the web development company they had instructed. This involved supporting the developers by answering questions they had regarding the layout of the new website. We provided a detailed breakdown of the metadata for each page, inline with keyword research – this means the pages would retain what made them initially great and have further improved keyword targeting. Due to the activity of the previous SEO supplier, we needed to analyse the backlink profile and disavow links which were potentially dangerous for the client’s Google rankings. We successfully discovered each and every link and carefully handled the links over a series of months, whilst progressing with other elements of the SEO campaign. As part of any SEO campaign, link building was necessary. We analysed the leading competitors links and replicated their best links in order to help us outrank them. Most of the links were directory links, due to the nature of the business but we also ventured into guest posting. Our client had moved business address multiple times. This makes it very hard for Google to rank you for your target keywords, when there are links on directories listing various different addresses. We managed to manually update all the citations, which certainly helped stabilise the SEO.